This wireless digital transmitter enables you to send video between two locations where hardwiring is difficult or impracticable. Video only, no audio. It works with most video cameras with RCA or BNC AV outputs (NTSC or PAL). See a sample system setup here. The transmitter kit works with camera with or without PTZ features. The transmitter operates on microwave radio system - no internet connection required, no bandwidth to worry about. It is therefore particularly useful in those remote locations where there is no internet/network coverage or out of WiFi range. 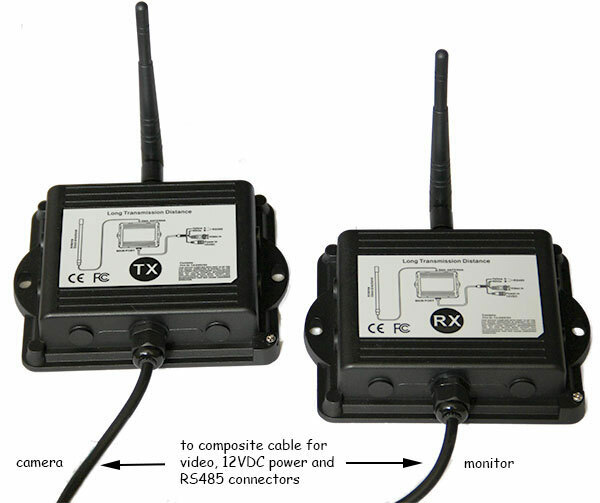 The transmitter sends video signal wirelessly to the included receiver. Transmission effectively avoids common radio interferences caused by other wireless equipment such as blue-tooth, cordless phone, WiFi etc. operating in the vicinity. Random ID coding between the transmitter and the receiver secures the privacy of video transmission. Transmitter. Video signal sent out from the transmitter can only be received by a receiver matching the random ID code. The pairing process between the transmitter and the receiver can only be done within a 3-meter range. A transmitter can only be paired with one receiver at a time. BNC video input plug for video input from video camera. Viewing live video feed over the internet or mobile phone. If you have a DVR and other equipment connecting to the internet, you may connect the wireless receiver to one of the video inputs of your DVR so that you can view the camera footage live in a remote location over the internet or on your cell phone. A sample setup can be found here. Frequency Hopping Technology. Adopting Frequency Hopping Spread Spectrum (FHSS) and auto pairing with random ID to avoid unauthorized reception, interception or jamming. These technologies also substantially reduce interferences from other sources of radio disturbances to ensure a steady and quality video stream. RS485 interface. This transmission system not only allows you to send video from one location to another. It also gives you the ability to control the Pan/Tilt/Zoom movements of your PTZ camera via the RS485 wires on the receiver, through a PTZ keyboard, a DVR with PTZ control functionality or other PTZ controller. The PTZ protocol supported by this system is Pelco P or Pelco D (auto detected). The baud rate supported is 2400 bps. Easy installation. Set up can be completed within minutes. Range may vary substantially depending on the actual operating environment. Much longer range can be achieved in aerial applications. Up to 300 meters (1000 feet) open space with the included omni-directional antennas. Longer distance up to 5 km (3 miles) can be achieved if high gain directional antennas are installed in a line of sight environment. AV signal can travel through some obstructions such as wall, partition, tree and so forth but in this case, the transmission distance will be reduced depending on the type, materials and the number of the obstructions in the transmission range. Overall, signal transmission is much better than FM transmitter particularly in multipath environments such as urban area. RS485 Interface Supports Pelco P or Pelco D protocol (auto-detected). Baud rate: 2400 bps. Using high gain omni-directional antenna will improve the transmission range. If the transmission path is line of sight, the transmission/reception may be significantly improved by using Yagi antennas, panel antennas or other directional antennas. 1. A digital video transmitter with a composite cable for video, 12VDC power and RS485 connections. 2. A digital video receiver with a composite cable for video, 12VDC power and RS485 connections. 3. Two 3dBi dipole antennas. 4. Two screw terminals for the RS485 wires. 5. Two universal regulated 12V 100~240V AC/DC power adapters.